Nancy leathem's Trees and Branches: Horace Atkin (15) and Gordon Pettit (11) Murdered Thornleigh,Pennant Hills,1906. Horace Atkin (15) and Gordon Pettit (11) Murdered Thornleigh,Pennant Hills,1906. An inquest was held yesterday afternoon at Thornleigh Hotel, before Mr William Clarke, Coroner, on the bodies of the boys, Albert Gordon Pettit, 9, and Horace Aiken, 16, who were murdered at Pennant Hills on Wednesday. Dr. Cowley, of Beecroft, said the bodies were hacked about the head, the appearance of the wounds suggesting that they had been caused by both sides of the tomahawk. John Edw. Hockley, a slaughter man, stated that he was standing on the Thornleigh railway Station on Wednesday evening, when he was struck in the back by the China-man. Witness went to run away, and, on turning, he received a second blow on the head. He saw Mr. Calvert, and Constable Allen, who chased the Chinese, and caught him at Hines house. Thomas Pollard, butcher, said he saw the Chinese chasing young Pettit after he left Pennant Hills Station, and knock him down. He then walked along the road towards Hines cottage. Witness saw him run into Hines house, through the door, and he saw the Hines family getting out of the window. He went back and found Pettit was quite dead. Witness returned to Hines cottage, and saw the police arrest the Chinese. Witness never saw the China-man strike Aiken. 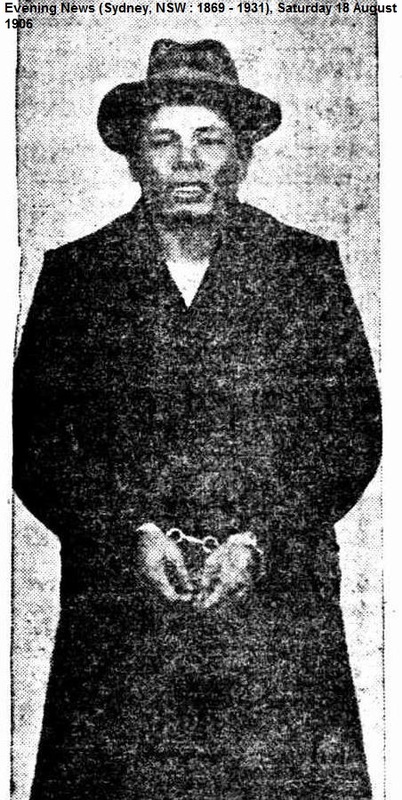 Ethel Hines, living at Stephen-street, Pennant Hills, stated that at 5.10 p.m. on Wednesday she received groceries from Aiken, who had gone out to his cart. She saw a China-man going towards Aiken's cart, holding a tomahawk behind him. He spoke to Aiken, and she saw Aiken bend down, as though looking for something, when the China-man struck him on the back of the head. Aiken fell out of the cart, and tried to run; but the China-man struck him three or four times. The China-man then rushed up to Hines horse, brandishing the tomahawk. Witness and her sisters ran into the dining-room, and locked the door. They subsequently made their escape through a window, and ran to Mr. Shields' residence. Frank Dakin, a boy of 11 years, stated that he saw a man running along the road with an axe. He also saw him hit Horace Aiken, who fell out of his cart. Witness on seeing this ran away. Esther Hines gave similar evidence to her sister, Ethel. Constable M’Donald, of Beecroft, said: I went to the residence of Mr. Hines, where I saw a crowd. A man named Charles Aiken then burst the door open, and I rushed in, and closed with the Chinaman. He made two blows at me with the tomahawk. The first blow passed my face. I ducked to the left. The handle of the tomahawk struck my shoulder. The second blow injured my hand. I caught him by the arm and throat. 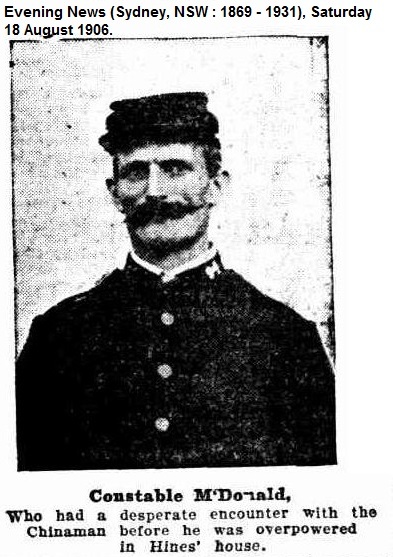 Constable Allen caught the tomahawk, and wrenched it from his hand. We threw him and handcuffed him. On the way to Pennant Hills railway the China-man said, 'I not mad! Devil tell me kill three! You shootee me, no harm! I very sorry now!' The China-man and tomahawk were covered in blood. He speaks good English, and has been in the colony two years. Constable Allen: On receiving word of the affair he went to Mr. Hines house I saw Aiken lying on the road in front of the house with numerous cuts about his head. With Constable M'Donald arrested the China-man in the house. Joe Toung, a Chinese gardener, working at Thornleigh, said he knew John Tye, who came to his hut on Monday, and stayed the night. Tye slept in a bush camp on Tuesday night, and came to his (witness) hut at 7 o'clock, on the morning of the tragedy. John Tye stayed until 4 o'clock, when he left with another China-man, named Yee Sam, to catch the train for Sydney. After they had left witness missed his tomahawk (the one produced was his). He stated that he gave John Tye 4s to pay his fare. During the inquest, John Tye sat very quiet and listened attentively to all the evidence. He made no attempt to be troublesome. On one occasion when spoken to by the Coroner, he said, 'Me bit deaf, not very well hear, me come closer, and moved towards the officers, at which there was a general shuffle. But a tight grip was laid hold of his arm, and he was sternly requested to keep his seat. On another occasion he said, 'Me wish everybody welly good; me want to be good — go to Heaven. The Coroner returned a verdict of wilful murder against John Tye, who was committed for trial. Charles Tye, a Chinese gardener, ran amok at Thornleigh on August 15th, and with a tomahawk murdered two boys in the most brutal fashion. The names of the unfortunate victims are Horace Aiken (15) and Gordon Pettit (11). The assassin also injured a policeman and another man. When at Thornleigh railway station Tye became agitated and savagely attacked a slaughter-man named J. Hockley, who was wounded over the eye. He then made towards Pennant Hills, and meeting the boy Pettit battered his head in a shocking manner. He next attacked the boy Aiken, knocking him out of a cart and killing him. Tye afterwards rushed to a house and set fire to some bedding. He was captured by the constable’s after a violent encounter. On being taken to the lock-up the murderer asked the police to shoot him. Tye expressed sorrow for his deeds, but said he had to kill three people to get to heaven; the devil made him do it. He also stated he was sorry for killing young Aiken, whom he knew to be a good boy. The Maitland Daily Mercury NSW. At the Central Criminal Court this morning Mr. Pollock, Crown. 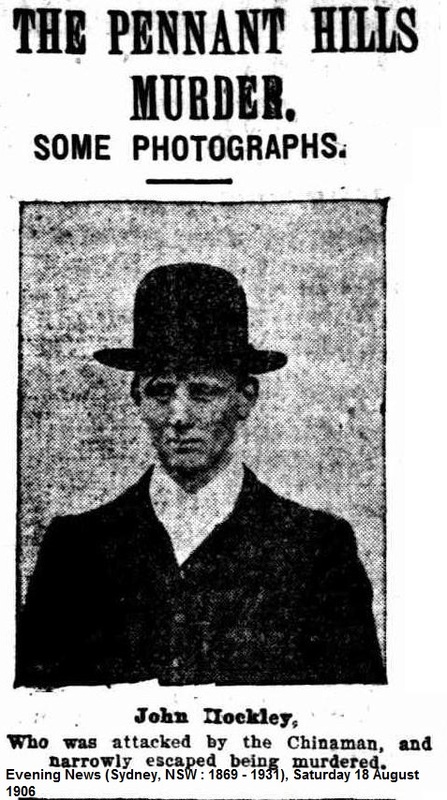 Prosecutor, informs Justice Fitzharding that the China-man John Tye, who was to have been tried at the present sittings of the Court on a charge of murdering two boys at Pennant Hills, had been certified by two doctors to be insane. Mr. Pollock said Tye had been removed to a lunatic asylum, and would remain there until sufficiently sane to take, his trial. The recent sad tragedy at Pennant-hills, when two lad's named Pettit and Aiken were done to death by a demented Chain-man, named Charlie Tye, has been the means of bringing out one of the many good points of the Chinese. As soon as the terrible news come to hand, Mr. Yeo Hing (president of the Chinese Merchants' Association of Sydney) at once forwarded a latter of sympathy to each of the bereaved parents, and called a meeting of Chinese merchants for the purpose of ascertaining what could be done in the way of relieving any distress that may have been caused by the unfortunate incident. The outcome of such meetings was that on Saturday delegates from the Sydney branch of the Chinese Merchants Association and Chinese Empire Reform Association, consisting of Messrs. L. Yee Hing (president),Tong Chih Chah (editor Tung Wah Times newspaper), Cheo Dock (Messrs. Nom Chong and Co, Braidwood, from which district the unfortunate man came, and S. Chong Messrs. Wing Sang and Co.), visited Thornleigh and Pennant hills, and handed both Mrs. Pettit and Aiken cheques for substantial amounts, and at the same time expressed their deep sympathy and sorrow that the terrible tragedy should have been caused by one of their own countrymen. Mr. J.G. Shields, of Pennant-hills, whose daughter was being married on the day of the tragedy, did much to assist the delegates in their task, for which Mr. Yee Hing tendered him their heartfelt thanks before returning to the city. yes but what is weird is the Aiken is on my mothers side and Pettit on my fathers. Hello Nancy, from another Nancy. If you want to read a full account of the murder of Horace and Gordon I just came across this link while doing some research for a workmate instead of working.